When we went camping late last summer, I was struck by a sense of increased communal spirit, both within our family and with our neighbors in the campground. Somehow, sharing labor, equipment, and food felt easier than it normally does. Without needing to be asked, Zeke and Ozzie eagerly and proudly gathered twigs and leaves to help build the fire. A neighbor noticed that we were having some trouble in the wet weather, so she gave us some of her highly flammable logs to make our lives easier. After Alison and I had trouble sleeping on a leaky air mattress, the boys let us use their sleeping bag pads. Then, we all worked collectively to make smores, and we took turns eating them. Philosopher G.A. Cohen believes that our behavior on camping trips is both a model and an argument for Socialism. Since egalitarian and community principles motivate us when we go camping, they should also guide us when we return to “civilization” and lead us to adopt a type of Socialism that guarantees equal income (or at least equal hourly wages) for everyone. Unfortunately, we haven’t developed enough mechanisms for this kind of Socialism; and we haven’t sufficiently explored models that have already been envisioned, like Joseph Carens’ method of redistributing all earnings via taxes in a market based economy. As we returned from our camping trip, I tried to imagine what it might be like to live in Carens’ Socialist world; but I started worrying if I was capable of sharing enough to do so. The communal spirit that we had enjoyed in the mountains had already dissipated; and, in the process, a familiar ambivalence about sharing had overtaken me. I was entranced by the egalitarian and community principles of the camping trip; but the very thought of sharing all my income through taxes was terrifying, and it made me want to cling to my possessions even more selfishly. I was wrestling with similar thoughts when I reluctantly shared my tripod with Zeke and Ozzie. Zeke must have sensed my ambivalence, because his behavior oscillated between different positions about sharing, just like my feelings did. At first, he was happy to share the tripod with Ozzie, and they explored it together quite harmoniously; but then Zeke insisted on “privacy” and a chance to play with it by himself. Zeke enjoyed his time alone with the tripod, but he seemed to regret how things had evolved once it became Ozzie’s turn. After giving Ozzie some time, Zeke returned and wrested it from him. He stopped me from scolding him by saying that he was merely showing Ozzie “how to do it”; and then he proceeded to work on the tripod with Ozzie, sharing it beautifully with him like he had done initially. While all of this unfolded, my mind turned to Darwin’s theory of multi-level selection, which describes how we’re simultaneously driven by the opposing forces of individual selection to act selfishly and group selection to act altruistically. Our genes send us mixed messages and confuse us. They encourage us to be greedy, but they also ask us to share. They promote altruism towards family members via kin selection (Fisher, Haldane); towards friends and colleagues via group selection (Darwin, Wright, Wilson); and even towards strangers, if there is a reasonable chance of reciprocity (Trivers). I’m certainly grateful that I have biological impulses to act altruistically, but I’m also aware that I can’t rely on them. They won’t free me of the fundamental conflict between altruism and selfishness that is wired into my DNA, and they won’t enable me to reach beyond my current limitations. I will have to look for inspiration elsewhere, as I strive to live in ways that are at least a bit more aligned with the egalitarian and community principles that Cohen describes. Joel Tauber is an artist and filmmaker who teaches experimental film and orchestrates the video art program at Wake Forest University. 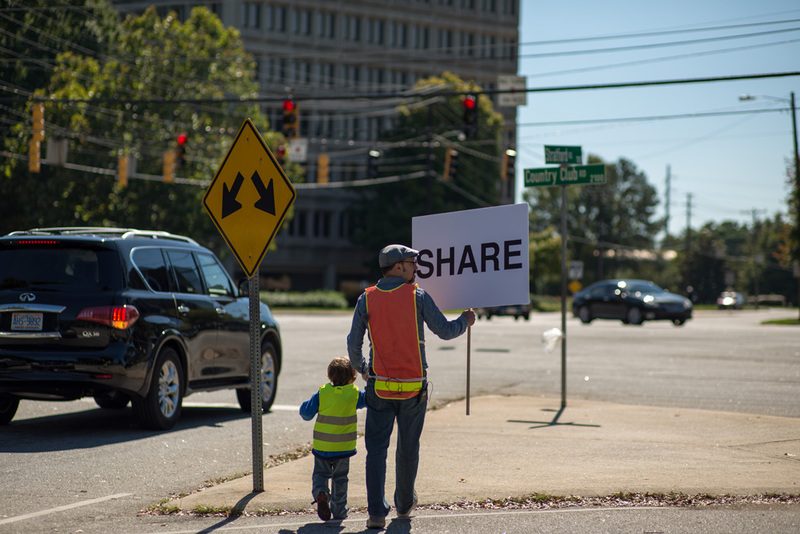 His current undertaking – “The Sharing Project” – is both a sculptural video installation and a feature film.